Copyright: © 2016 Ma F, et al. This is an open-access article distributed under the terms of the Creative Commons Attribution License, which permits unrestricted use, distribution and reproduction in any medium, provided the original author and source are credited. In order to improve interfacial compatibility between beta-tricalcium phosphate (β-TCP) with poly-L-lactide (PLLA) to prepare bone tissue engineering (TE) scaffold material, a surface modification of β-TCP with stearic acid was investigated. Interfacial interaction between β-TCP particles with stearic acid was studied using Transmission Electron Microscopy (TEM), Fourier Transform Infrared Spectroscopy (FTIR), Thermal Gravimetric Analyzer (TGA) and X-ray Photoelectron Spectra (XPS). The unmodified β- TCP/PLLA and modified β-TCP/PLLA composite nanofiber membranes with different quality ratios were prepared by electrospinning. Morphology of these composite nanofiber membranes was observed by using scanning electron microscope (SEM). Mechanical properties of these composites were also tested. The results indicated that hydrogen ions of stearic acid produced protonation reaction with oxygen ions in phosphate of β-TCP and then generated hydroxyls. The β-TCP particles modified by stearic acid reduced the agglomeration of β-TCP particles in matrix and obtained continuous and uniform nanofibers. The mechanical properties of the modified β- TCP/PLLA composite nanofiber membranes were significantly improved than those of unmodified β-TCP/ PLLA composite nanofiber membranes. Electrospinning is a simple technique to produce nanofibrous substrates with controllable fiber diameters . Electrospun nanofibers have been employed as various tissue engineering (TE) scaffolds, including bone, cartilage and myocardium [2,3]. Such nanofibous scaffolds have also been applied for bone regeneration. The fibrous architecture from electrospinning is similar to that of neutral bone structure and is capable of directing regeneration of damaged bone. The porosity of this fibrous structure further allows for cell migration, nutrition (and oxygen) diffusion and osteoblast incorporation. To date, a wide range of biodegradable natural or synthetic polymers, such as poly (ε-caprolactone), Poly-Llactide (PLLA), poly (DL-lactic-co-glycolic acid), collagen and gelatin have been used as the bone TE scaffolds materials . PLLA is a biodegradable polymer with a long history of safe medical use in various surgical applications including suture, plates, screws, nails, and pins . Furthermore, PLLA can be designed as TE scaffolds by controlling their porosity, mechanical properties, and the rate of their bulk erosion. But degradation product of PLLA in body is acidic and easy to cause human body aseptic inflammation [6-8]. This problem may be solved by the addition of beta tricalcium phosphate (β- TCP) which can neutralize the acidic degradation of PLLA. On the other hand, calcium ions and phosphate ions released from the β-TCP degradation product can provide mineral elements for bone regeneration. However, for the mentioned organic/inorganic biocomposites, the poor interfacial compatibility between β-TCP and PLLA is one of the major factors determining the composite. After implantation, the interfacial layer will be destroyed firstly, thus inorganic particles may easily disengaged from the matrix, resulting in a sharp decrease of mechanical properties in a short time. As a result, the mechanical properties, microstructure and microcomposition environment of the composites are deteriorated. Surface modification of β-TCP will provide an effective mean to manipulate the inter-surface properties, and develop optimized biomaterials . Various methods have been developed to improve the adhesion between the filler and matrix. Silane coupling reagents, organic isocyanates, polyacid etc had been used to modify the surface of inorganic particles [10-15]. However, most of the grafted organic molecules mentioned above are inhomogeneous for the organic or inorganic composition of the composites, which is harm to the biocompatible of the materials. Stearic acid could be involved to modify β-TCP because it is a kind of saturated fatty acid in human body and has no physical toxicity [16-18]. In this study, a method for surface modification of β-TCP by stearic acid is designed. And modification mechanism of stearic acid was studied by various characterization means. Furthermore, modified or unmodified β-TCP/PLLA composite fiber membrane was fabricated using electrospinning. Morphology of the composite fiber membranes was observed using SEMand the effect of surface modification on the interface bonding between β-TCP particles with PLLA matrix was evaluated by tensile tests. The β-TCP powder was supplied by Shanghai MicroPort Orthopedics Company, and the purity was not less than 96 wt %. The size of β-TCP particles was measured using a Laser particle size analyzer (DTS Zetasizer Nano (Malvern Instruments, Worcestershire, UK) by measuring dynamic light scattering (DLS) of a 10 mg/ml β-TCP suspension in ethanol, which showed that the size of β-TCP particles mainly ranged from 50 nm to 200 nm. Stearic acid, PLLA (Mw = 6.0 × 105) was supplied by Sigma-Aldrich company and Nature works company. Dichloromethane and anhydrous ethanol are of analytical grade (AR) and used as received (Sinopharm chemical reagent Co., Ltd). The β-TCP powder was added into deionized water and ultrasonically dispersed for 30 min to form a suspension solution. Stearic acid was dissolved in anhydrous ethanol at 60°C, and then the solution was poured into the β-TCP suspension solution and stirred. The mixed solution was stirred for 30 min for the reaction completion between stearic acid with β-TCP particles, and then the solvent was filtered out. The treated β-TCP particles were washed with anhydrous ethanol for five times. Finally, the treated β-TCP particles were dried at 60°C for 24 h.
DCM and DMF were mixed with the ratio of 7:3, and PLLA dissolved in mixed solvent with the solution concentration of 10%. β-TCP particles were add into mixed solvent, and obtained suspension with mass concentration of 10%, then the suspension was added into PLLA solution, obtained mixture with mass concentration of 10%. The mixture was added to electrostatic spinning equipment, and obtained composite nano fiber membranes with conditions of 10 kV voltage, 15 cm receive distance and 1 mL/h flow velocity. Finally, composite nano fiber membranes were dried at 60°C for 24 h.
The morphology of the β-TCP particles before and after modification by stearic acid was observed by a JEM-2100 transmission electron microscope (TEM). The groups of the samples were analyzed by Fourier transform infrared spectroscopy (FTIR SPECTRUM 100). Eisen Palmer device (Pyris 1 TGA) was used for the thermo-gravimetric measurements. The samples were heated in platinum pans under nitrogen (80 ml/min) with a 10°C/min heating rate in the temperature range of 50°C to 500°C. Before measurement, the samples were dried in a vacuum box at 80°C for 12 h. X-ray photoelectron spectroscopy (XPS, AXIS UltraDLD) was used to analyze the elements and groups of the β-TCP particles before and after modification. Composite nano fiber membranes metalized with Q150TES coating apparatus, and observed by using Quanta FEG 450 SEM. Composite nano fiber membranes were cutted to 5 mm × 40 mm strip sample and tested their tensile properties by using precisionline vario micro tensile machine, rate of extension was 20 mm/min. Samples for tensile tests were pressed with a mould on a thermo-compress machine at 190°C by using composite nano fiber membranes. The used pressure and holding pressure time was 10 MPa and 5 min. Mechanical properties of the composites were evaluated by tensile tests. The tests were performed on a universal material testing machine (Zwick 2.5 kN) at room temperature. Size of the tensile samples was 60 mm in gauge, 15 mm in width and 2 mm in thickness. Loading speed used in tensile tests was maintained at 5 mm/min. Mechanical properties were calculated based on tensile tests. Figure 1 shows the TEM micrographs of the β-TCP particles before and after modification. As presented in Figure 1a, the β- TCP particles as received are rectangle flakes with a size 100 nm to 200 nm in length and 50 nm to 100 nm in width. The boundaries of the particles are clear and the surfaces are smooth. Figure 1b shows the TEM of the β-TCP particles after modification. The size of the particles after modification is still sub-micron grade similar to that before modification. However, the β-TCP particles are coated by stearic acid, which results in rough surface and unclear boundary. 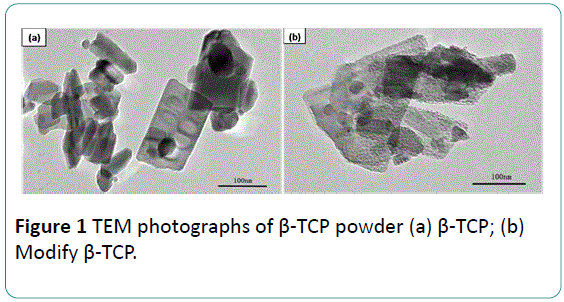 Figure 1: TEM photographs of β-TCP powder (a) β-TCP; (b) Modify β-TCP. The FTIR spectra of stearic acid and the β-TCP before and after modification are presented in Figure 2. In the Figure 2a, the wide region of 3405.33 cm-1 is an absorption band of H2O. The absorption bands of 471.69 cm-1, 566.52 cm-1, 605.88 cm-1, 960.42 cm-1, 1032.47 cm-1 and 1088.39 cm-1 are PO4 3- characteristic bands . 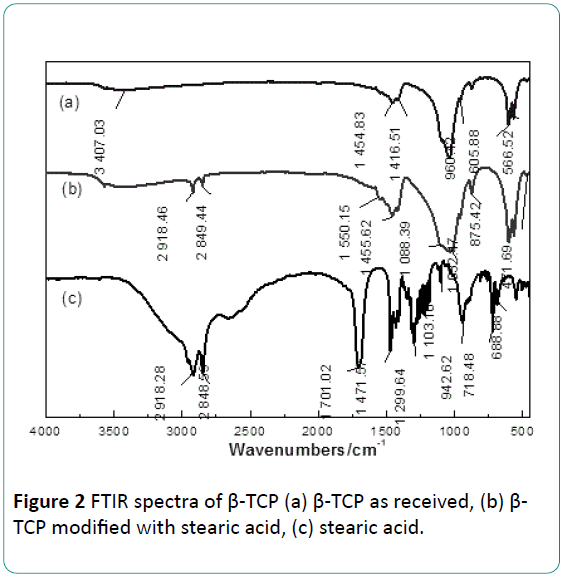 Figure 2: FTIR spectra of β-TCP (a) β-TCP as received, (b) β- TCP modified with stearic acid, (c) stearic acid. As Figure 2b presented, some characteristic bands of stearic acid can be found in the spectrum of modified β-TCP compared with the FTIR spectrum of the stearic acid presented in Figure 2c. The absorption band of 2850.73 cm-1 is the symmetric stretching vibration peak of (-CH2 -) group, and the absorption band of 2919.07 cm-1 is the asymmetric stretching vibration peak of (-CH2 -) group . The absorption band at 2960.86 cm-1 is the anti-symmetric stretching vibration peak of -CH3. The peak around 1550 cm-1 can be attributed to the stretching vibration peak of carboxylate COO-. In Figure 2c, the absorption band at 1703.73 cm-1 is the stretching vibration peak of the carbonyl group (C=O) in carboxylic acid, and the absorption band at 1298.76 cm-1corresponds to inplane vibration peak of C-O and O-H groups in the carboxyl group (-COOH) . It deserves to pay special attention that in Figure 2b two shoulder absorption bands of HPO4 2- appear at the region 875.42 cm-1. However, these absorption bands are not found in the spectrum of β-TCP or stearic acid. The mass loss of the modified or unmodified β-TCP was quantitatively determined by means of TGA measurements, and the results are presented in Figure 3. It can be seen that the curve of the unmodified β-TCP consists of two mass loss regions. One region (50°C to 150°C) results from the evaporation of physical adsorption water on surface. The other region (150°C to 500°C) corresponds to the evaporation of other kind’s water of β-TCP, which includes chemical adsorption water, crystal water and lattice water. But the curve of β-TCP after modification consists of three mass loss regions. First one (50°C to 150°C) is the signal of the evaporation of physical adsorption water. Second one (150°C to 360°C) is mainly caused by the oxidation of organic matter. And the third one (360°C to 500°C) mainly results from o the evaporation of lattice water in β-TCP . 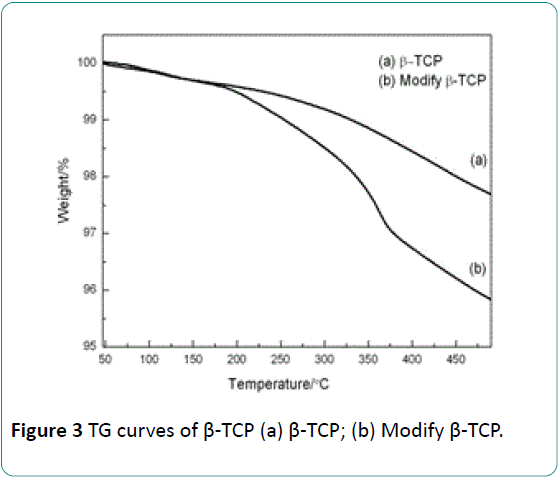 Figure 3: TG curves of β-TCP (a) β-TCP; (b) Modify β-TCP. The XPS full patterns of the β-TCP before and after modification are presented in Figure 4. Peaks of Ca, O, P and C elements can be indentified in the pattern of the β-TCP before surface modification. The peak of C element is attributed to CO3 2- group that was brought by the impurity of β-TCP. Compared with the pattern of β-TCP before modification, the peaks of Ca and P from the β-TCP after modification become weak, but the C peaks tend to be stronger. This phenomenon results from a reduction of the amounts of Ca and P atoms but the increase of the amount of C atom due to the formation of the stearic acid coating. 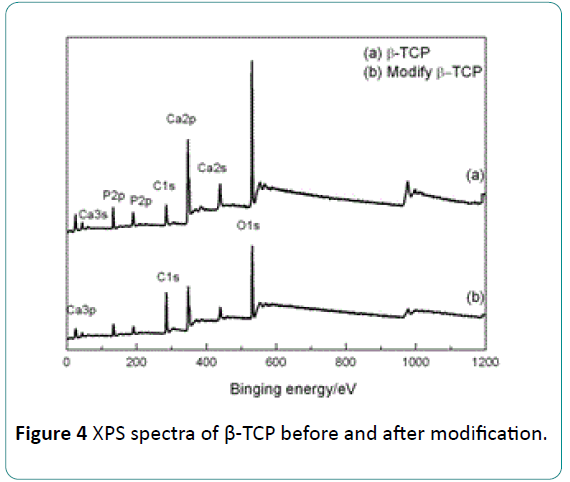 Figure 4: XPS spectra of β-TCP before and after modification. Figure 5 shows the XPS pattern for P element of the modified β-TCP. As presented in Figure 5, the peak of P at 133.28 eV is the signal of (-P=O) in PO4 3-. The peak at 133.81 eV corresponds to the (-P-OH) group in HPO4 2- . It confirms the finding of the formation of HPO4 2- group based on FTIR results. It is suggested that the (–OH) group in HPO4 2- is formed by the protonation reaction between H+ in stearic acid with O atom of PO4 3- in the β-TCP. These (–OH) groups formed on the β-TCP surface can interact with (-C=O) in PLLA in means of hydrogen bond. The hydrogen bond between the modified β-TCP with PLLA can improve the interfacial bonding between them, and an increase in the mechanical properties of the β- TCP/PLLA composite can be expected. 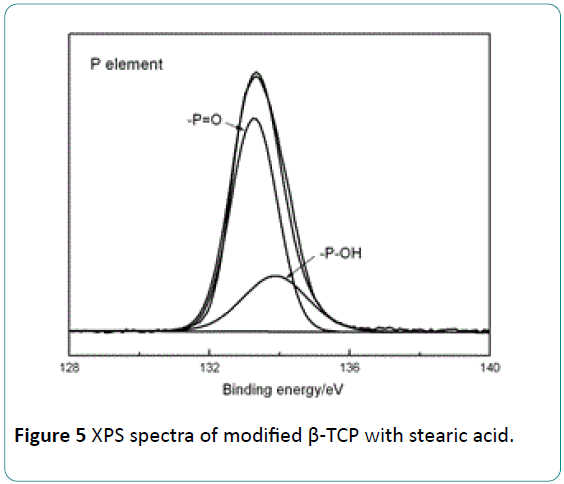 Figure 5: XPS spectra of modified β-TCP with stearic acid. Figure 6 shows SEM photographs of composite nanofiber membranes before and after modification with different mass ratio, morphology of pure PLLA nanofibers membranes is presented in Figure 6a. Surface of pure PLLA fibers is symmetrical and smooth, and diameter of fiber is homogeneous. When β-TCP particles are incorporated into nano fibers, roughness of the fibers increases, diameter of the fibers is very asymmetrical, and there are many spindle nodes in these fibers. As the amount of β-TCP particles added into nano fiber membranes increases, this phenomenon is more serious. The formation of spindle nodes may result from the high polarity of β-TCP particles. Many β-TCP particles reunite due to the polarity of the particles, especially for the particles with nano meter in size . And interface compatibility between reunited β-TCP particles with PLLA matrix become worse. Diameter of the reunited β-TCP particles is big than nanofiber, so separation between β-TCP and PLLA matrix is very serious. Figure 6: SEM photographs of composite nanofiber membranes, (a) pure PLLA, (b) PLLA with 10% unmodified β- TCP, (c) PLLA with 10% modified β-TCP, (d) PLLA with 20% unmodified β-TCP, (e) PLLA with 20% modified β-TCP. Compared with unmodified composite nanofibers, fibers of modified composite are symmetrical, though there are still some little nodes. Morphology of fibers is relatively well, and most fibers diameter is symmetrical. There is no separation phenomenon between β-TCP and PLLA matrix, which can be attributed to the effect of surface modification by stearic acid. Stearic acid adsorbed on β-TCP particles reduced the polarity of β-TCP particles, and the interfacial compatibility between β- TCP and PLLA is also improved by this treatment. Mechanical Properties of β-TCP/PLLA composite nanofiber membranes before and after modification with different mass ratio is shown in Table 1. It is observed that the incorporation of unmodified β-TCP particles leads to tensile strength and young's modulus of composite nano fiber membranes decreases dramatically. The decrease may result from the agglomeration of β-TCP particles. And it is hard to obtain continuous composite nanofibers for reunited β-TCP particles. And there are numerous defects in nanofibers because inferior interfacial compatibility between β-TCP and PLLA matrix. Table 1: Mechanical properties of β-TCP/PLLA composite nanofiber membranes M-β-TCP: β-TCP Modificated with stearic acid. Compared with unmodified composite nanofiber membranes, tensile strength and young's modulus of those modified with stearic acid increase significantly. This is because that the polarity of β-TCP particles is reduced by surface modification and β-TCP particles are homogeneous in PLLA matrix when stearic acid absorbed on β-TCP particles surface. This study suggests that stearic acid coats β-TCP particles during the surface modification. XPS analysis reveals that proton reaction between H+ of stearic acid with O atom in PO4 3- of β-TCP particles surface generates –OH, so that stearic acid coats β-TCP particles, and interfacial compatibility between β-TCP and PLLA is improved by this stearic acid layer. Stearic acid surface modification has significant influence on the morphology and mechanical properties of beta TCP/PLLA composite nanofibers membrane. SEM results suggest that compared with unmodified β-TCP particles, modified β-TCP particles distribute in PLLA matrix symmetrical, and composite nanofibers are symmetrical and continuous. Mechanical properties tests show that the modified β-TCP/PLLA composite nanofiber membranes present better mechanical properties than unmodified ones. The authors would like to acknowledge the financial support provided by the National Research Fund of Science and Technology Commission of Shanghai Municipality under Grant No. 09ZR1422100, the Fund of Science and Technology Commission of Shanghai Municipality under Grant No. 11441900501, the Innovation Research Fund of Shanghai Municipal Commission of Education under Grant No. 10YZ94 and Key Laboratory of Advanced Metal-based Electrical Power Materials. Cao H, Chen X, Yao J, Shao Z (2013) Fabrication of an alternative regenerated silk fibroinnanofiber and carbonated hydroxyapatite multilayered composite via layer-by-layer. J Mater Sci 48: 150-155. Huang YY, Wang DY, Chang LL, Yang YC (2010) Fabricatingmicroparticles/nanofiberscomposite and nanofiber scaffold with controllable pore size by rotating multichannelelectrospinning. J BiomaterSciPolym Ed 21: 1503-1514. Yang F, Murugan R, Wang S, Ramakrishna S (2005)Electrospinning of nano/micro scalepoly(L-lactic acid) aligned fibers and their potential in neural tissue engineering. Biomaterials 26: 2603-2610. Baker BM, Gee AO, Metter RB, Nathan AS, Marklein RA, et al. (2008) The potential to improve cell infiltration in composite fiber-aligned electrospunscaffolds by the selective removal of sacrificial fibers. Biomaterials 29: 2348-2358. Hanawa T, Kon M, Ukai H, Murakami K, Miyamoto Y, et al. (1997) Surface modifications of titanium in calciumoin-containingsolutions. Biomed Mater Res 34: 273-279. Zhang RL, Liu Y, Huang YD (2013)Interfacial reaction kinetics of carbon fiber composite. J Harbin Institute of Technoly 45: 69-74. Hu CB, Xu Q, Yuanliang YLW (2013) Microstructure analysis of Ti-P polylactide synthesized by titanium (IV)complex as catalyst. Materials Science and Technology21: 18-25. Kunze C, Freier T, Helwig E, Sandner B, Reif D, et al. (2003) Surface modification of tricalcium phosphate for improvement of the interfacial compatibility with biodegradable polymers. Biomaterials 24: 967-974. Li Y, Zhang Y, Yin GF (2005) Surface modification in manufacture of ß-tricalcium phosphate/poIy(L-Iactic acid) composite scaffold materials. J Functional Materials 2: 298-300. Kikuchi M, Koyama Y, Takakuda K, Miyairi H, Shirahama N, et al. (2002) In vitro change in mechanical strength of b-tricalcium phosphate/copolymerized poly-L-lactide composites and their application for guided bone regeneration. J Biomed Mater Res 62: 265-272. Dupraz AMP, van der Meer SAT, de Wijn JR, Goedemoed JH (1996) Biocompatibility screening of silane-treated hydroxyapatite powders for use as filler in resorbable composites. J Mater Sci Mater Med 7: 731-738. Deb S, Wang M, Tanner KE, Bonfield W (1996) Hydroxyapatite polyethylene composites: effect of grafting and surface treatment of hydroxyapatite. J Mater Sci Mater Med 7: 191-193. Liu Q, de Wijn JR, Bakker D, van Blitterswijk CA (1996) Surface modification of hydroxyapatite to introduce interfacial bonding with polyactive 70/30 in a biodegradable composite. J Mater Sci Mater Med 7: 51-57. Liu Q, de Wijn JR, Bakker D, van Toledo M, van Blitterswijk CA (1998) Polyacids as bonding agents in hydroxyapatite polyester-ether (polyactivet 30/70) composites. J Mater Sci Mater Med 9: 23-30. Liu Q, de Wijn JR, van Blitterswijk CA (1998) Composite biomaterials with chemical bonding between hydroxyapatite filler particles and PEG-PBT copolymer matrix. J Biomed Mater Res 40: 490-497. HuangH, Tian M, Yang J, Li H, Liang W, et al. (2008) Stearicacidsurface modifying Mg(OH)2: mechanism and its effect on properties of ethylene vinyl acetate/Mg(OH)2 composites. J Applied Polymer Sci 107: 3325-3331. Tian-chen N, Chao Y, Jin-chun L, Xu-jie Y, Lude L, et al. (2008) Study of organic surfacemodificationof nanosizedZnO withstearicacid. China Surfactant Detergent & Cosmetics 8: 16-19. Karnnet S, Potiyaraj P, Pimpan V (2005) Preparation and properties of biodegradablestearicacid-modified gelatin films. Polymer degradation and stability 90: 106-111. Ming M, Xue-song W, Bing Z, Yan-chuan G (2012) Synthesis of pure ß-Ca3(PO4)2 bioceramics with gelatin by precipitation method. Imaging Science and Photochemistry 30: 269-279. Liao JG, Zhang L, Zuo Y, Li YB (2009) Surfacemodification of nano-hydroxyapatite with stearic acid. ChineseJournalofInorganicChemistry 25: 1267-1273. Zhou JL, Chen SZ (1990) XPS Study of Hydrogen Bond in Hydroxyapatite. ActaPhysico-ChimicaSinica 6: 629-632.